While removing your photos on iPhone from your camera roll is easy enough, but it’s impossible to delete photos that you synced from iTunes. Try as you might, you won’t be able to find an option to delete them. Why is this, though? And more importantly, how can you get rid of these photos easily? How to Delete Photos Synced from iTunes Library on iPhone? Open iTunes and click on your device icon. Below that, select the radio button next to Select Albums. Don’t choose any albums, though. This will delete all the synced photos from iPhone, which will also delete the photos that you want to keep on iPhone. You don’t need to use iTunes to delete your synced photos, though. There actually is another way. In fact, it’s even better than using iTunes because you can browse your photos selectively. Instead of dealing with all of iTunes’ usual restrictions and annoying anti-features, you can just use iMyFone TunesMate. Delete synced photos or any other kind of photo from your iPhone. Easily delete your iPhone photos on computer for free. Back up iPhone photos and albums to computer or external hard drive. Preview your photos before you transfer or remove them. 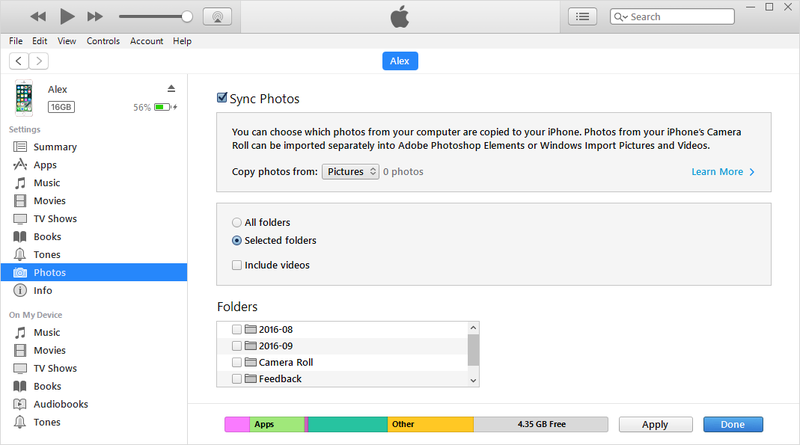 Manage your photos and other media without ever having to open iTunes. Also transfer and manage music, video, playlists, podcasts, audiobooks and 10+ more file types. As you can see, iMyFone TunesMate is a powerful tool that allows you to do whatever you want with your photos, without the random restrictions that Apple can put on them. No matter what folder your photos are in, whether or not you synced them with iTunes, TunesMate can help you reach into your iPhone and delete your photos easily. Step 1: Connect your iPhone to your computer and open iMyFone TunesMate. Step 2: Click the Photos tab at the top. You will see a list of the photos on your device. You can select album from the left sidebar and select which photos you would like to get rid of. Step 3: Click Delete near the top. Click Yes to confirm the deletion. Transfer just about any kind of file. Share songs with your friends, even if they have other Apple IDs. Transfer songs that you didn’t buy from the official Apple Store. Securely sync a new library with your device without fear of deleting the data that is already on there. Deleting synced photos from iPhone can be done with iTunes, but it is needlessly complicated and restricted. Instead, you can use iMyFone TunesMate to delete the photos easily and exactly the way that you want to. 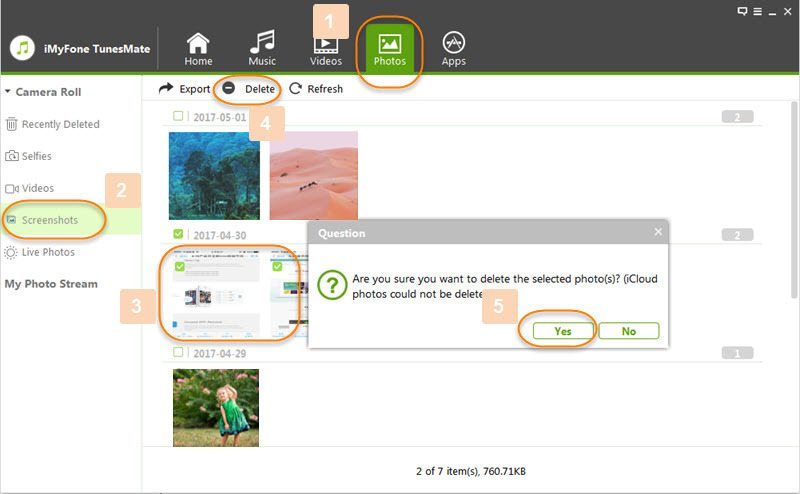 You can preview photos, delete them selectively, and even delete them in bulk if you want. Try TunesMate and get back your freedom over your photos.